My heart almost stopped when I read “The First Rule of Flight Club” (Zim Weighs In, Spring ‘18). As a member of a float plane family, I cannot imagine anything that is more a part of our heritage. We would head out aboard Dad’s Piper PA-12 for a fishing trip or simply a quick ride around the local area, and the scenery was mindblowing. Dropping in on friends on nearby lakes or a flyover with a wing tip wave was a treat. Now my brother is following in Dad’s footsteps with a Piper PA-12 of his own. I feel the same passion each time I see or hear the plane pass over my camp. It is sad that someone in cottage country would even suggest banning float planes. I cannot imagine having it any other way. Zim hit the nail on the head with this one. We have many other things to be concerned about. —Jay Mitroff, Bass Lake, Ont. 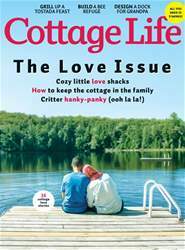 Love is in the air—and in the pages of the Early Summer issue of Cottage Life. Our readers’ sweetest (and silliest) romance stories from the lake Inspiring design ideas from three cozy little love shacks Tips for getting along with your neighbours The inside scoop on the (surprisingly frisky!) cottage critter dating scene Our essential guide to keeping the cottage in the family An easy, casual tostada feast to feed all your loved ones—even the ones with dietary restrictions Summer projects to show your love: a bee box for troubled pollinators, a nature-inspired centrepiece for a cottage wedding, and a dock staircase that’s good for Grandpa, kids, and pets The inspiring story of a cottager who, at 22, brought the struggling lakeside store of her childhood back to life Intel on the new tribunal that’s replacing the OMB and how cottagers can help steer their lake’s development Pick up the Early Summer 2018 of issue of Cottage Life for tips and ideas to make this your best season yet.